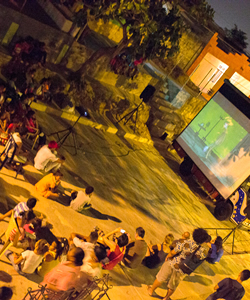 Each year the FICCI continues in its efforts to become ever more inclusive through its program Cine en los Barrios, which takes the movie experience out into the Cartagena neighborhoods as well as the other municipalities in the Department of Bolívar, where it shows more than 70 short films from all over the planet. We are pleased to be screening a retrospective of the LOOP Animated Film Festival, along with a sampling of children’s programming from Señal Colombia. As an added attraction this year, the Festival Ambulante is joining forces with us with a couple of very special screenings. In the same encouraging spirit, we will be going into Cartagena’s most disadvantaged neighborhoods to set up our traveling cinemas, the Cinemóviles, in plazas, street corners and soccer fields all over the city. Several community video enterprises, among them Barranquilla’s Historias de Barrio, Cali’s Estudios Takeshima, Bogota’s Cinemateca Rodante and COMFENALCO - Cartagena’s Jornada Escolar Complementaria, along with some short films turned out by the Imaginando Nuestra Imagen project, make their contribution to this program with presentations that play their part in forging filmmakers as well as audiences, our most valued target group. Throughout the week-long festival, some feature films, both in and out of competition, will also be screened in schools, universities, foundations, jails, hospitals, churches, libraries, retirement homes and cultural centers, offering a unique experience that brings together filmmakers, producers, actors and audiences.